My family is on a granita frenzy, we love them. And the fact that they are so easy to make, makes me want to keep making them. This was another hit with us. The beautiful pink flakes of ice, that melt in your mouth on contact, brilliant. The addition of lime to contrast the sweetness of the watermelon, brilliant. This dessert is beautiful to see and eat, very refreshing. It is amazing how something so simple can be so pleasing to eat. Place the sugar and water in a small saucepan. Bring to the boil, but don't boil, stir until the sugar has dissolved. Pour into a glass bowl, cool, then chill. Cut the watermelon into quarters, remove most of the seeds. Chop up the flesh into smaller pieces, place the flesh into a food processor and process until smooth. You can use a blender, do it in batches. 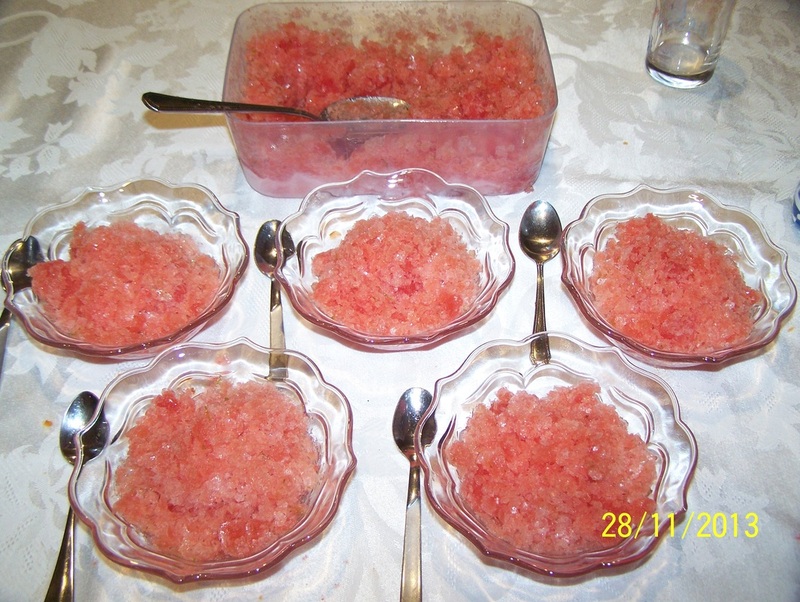 Strain the watermelon puree through a sieve into a plastic container that has a lid. Add the chilled syrup and lime rind and juice, mix well. Cover and freeze for two hours until the mixture around the sides has started to set and thicken. Using a fork scrap the set ice off the sides, give the mixture a good mix. Place back in the freezer, now every 30-60 minutes you will need to stir the mixture using a fork until the granita has set, with the ice crystals forming throughout the granita. Stop when you are happy with the consistency. Scoop it into serving bowls, add some lime wedges.